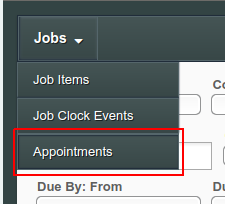 With today's release, it is now possible to directly search for appointments, and view a list of appointments that match that search. You can search for appointments by date range, status, service line, job type, customer, service location, office, released status, and technician assignments. Previously, any jobs created through our Service Opportunities bulk job creation feature were automatically assigned to the user who created them. With today's release, you can now choose the job owner for any batch of jobs created via Service Opportunities. 'Public Job Comments' - the content of all the public comments added to this invoice's job. Comments attached to the job's location and/or customer are not included (even if they are public), nor are private comments. Scheduling and technician comments are included if they are public (visible to everyone). The quote view has been improved so your customers will have a better experience when viewing your quotes on phones and small tablets. The items and prices import can now be used to update costs as well as prices when imported with the update_price_only flag. Read more about item and price imports here.